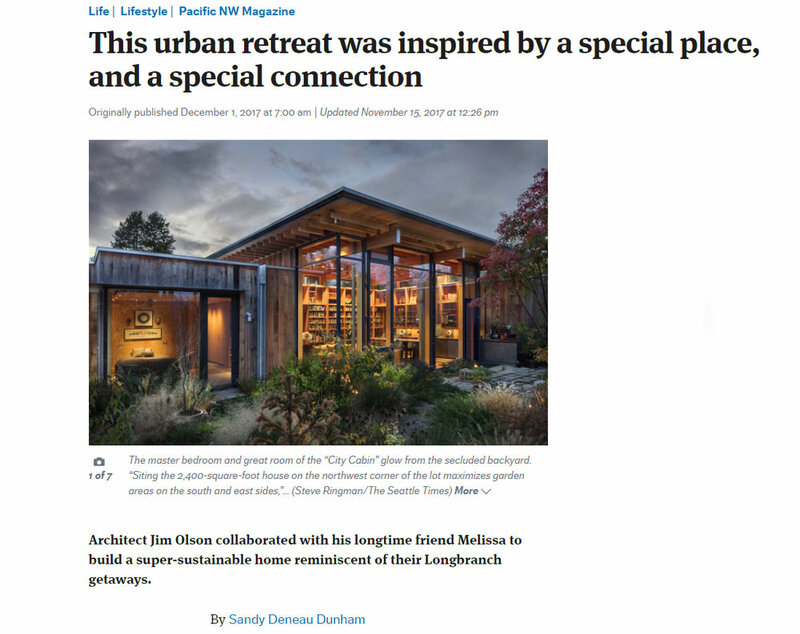 The Seattle Times Pacific NW Magazine (photos by Steve Ringman) recently featured our City Cabin, designed by Jim Olson of Olson Kundig. The City Cabin is located in Seattle’s Madison Park neighborhood, but Olson drew design inspiration from his own cabin on the shores of Puget Sound in Longbranch, WA. The 2,400-square-foot house is highly environmentally sustainable, meeting net-zero guidelines (but not official certification). 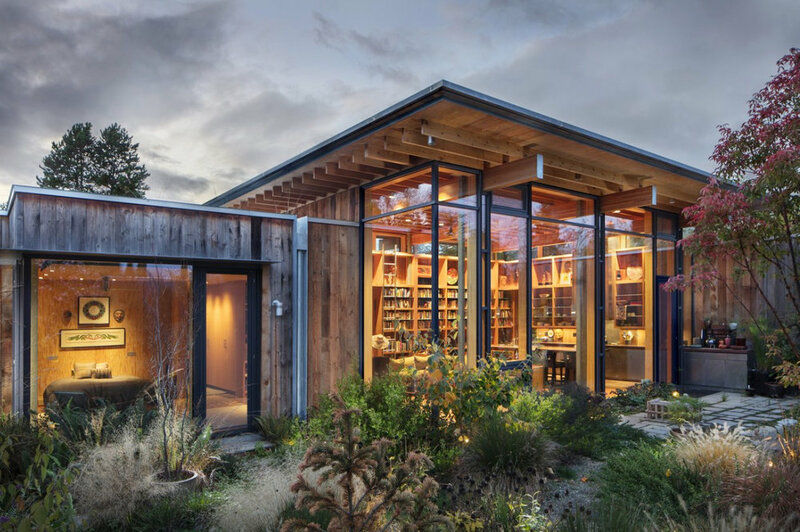 The residence features photovoltaic panels, a green roof, triple-pane windows from Germany, exterior cladding of reclaimed Douglas fir, and interior walls made of fir plywood. Additionally, there is an air-to-water heat pump, extra-efficient insulation, low-energy appliances, and LED lighting. 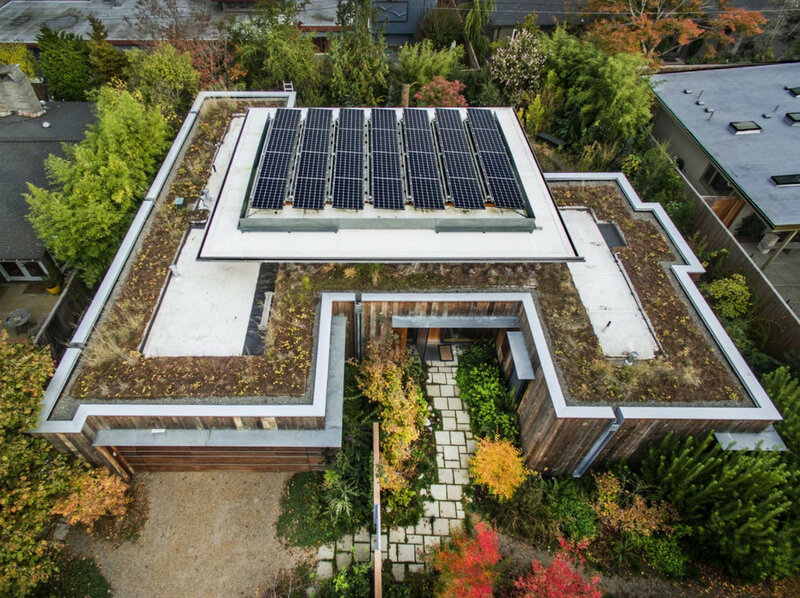 Photovoltaic panels sit atop the roof, surrounded by Northwest sedums, grasses, and wild strawberries. Inside, the reclaimed fir walls continue into the kitchen. The concrete floors are a custom integral color, embedded with hydronic radiant heat. The kitchen island is made from a slab of old growth fir that was dredged from a slough in the Skagit Valley, which was radio-carbon-dated at the University of Washington to 2,700 years old. Ultimately, the house reflects the client’s values of environmentalism, as well as a love for music, books, and Native American art.